Israelis go to the polls on Tuesday and Mr Netanyahu is competing for votes with right-wing parties who support annexing part of the West Bank. The settlements are illegal under international law, though Israel disputes this. Last month the US recognised the occupied Golan Heights, seized from Syria in 1967, as Israeli territory. Can Jewish settlement issue be resolved? Israel has settled about 400,000 Jews in West Bank settlements, with another 200,000 living in East Jerusalem. There are about 2.5 million Palestinians living in the West Bank. Palestinians want to establish a state in the occupied West Bank, East Jerusalem and the Gaza Strip. What happens to the settlements is one of the most contentious issues between Israel and the Palestinians - Palestinians say the presence of settlements makes a future independent state impossible. 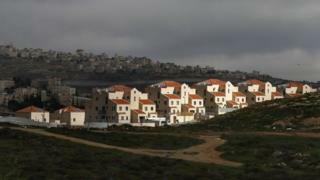 Israel says the Palestinians are using the issue of settlements as a pretext to avoid direct peace talks. It says settlements are not a genuine obstacle to peace and are negotiable. What exactly did Netanyahu say? He was asked during an interview on Israeli TV why he had not extended Israeli sovereignty to large settlements in the West Bank. "You are asking whether we are moving on to the next stage - the answer is yes, we will move to the next stage," he said. "I am going to extend [Israeli] sovereignty and I don't distinguish between settlement blocs and the isolated settlements." What has been the Palestinian reaction? Senior Palestinian official Saeb Erekat said the statement by Mr Netanyahu was "not surprising". He added: "Israel will continue to brazenly violate international law for as long as the international community will continue to reward Israel with impunity, particularly with the Trump administration's support and endorsement of Israel's violation of the national and human rights of the people of Palestine." A spokesman for Palestinian leader Mahmoud Abbas told Reuters: "Any measures and any announcements will not change the facts. Settlements are illegal and they will be removed." These comments by Benjamin Netanyahu are potentially explosive over an issue that has helped stall peace efforts for years. They will resonate with several parties with which he'll try to form a coalition government if he wins the biggest share of votes. But the very idea of annexation will rouse new Palestinian fury, as well as international condemnation. Mr Netanyahu may have been emboldened by the Trump administration, which just last month recognised Israeli sovereignty over the Golan Heights. Mr Netanyahu's right-wing Likud party is in a tight race with the new centre-right Blue and White alliance. However other parties, some of which support annexation, could end up being kingmakers when they try to form a governing coalition. In Mr Netanyahu's own Likud party, 28 out of the 29 lawmakers running for re-election are on record as supporting this approach. Until now the prime minister was the only exception. Mr Trump's administration is preparing to unveil a long-awaited Middle East peace plan, which US officials say will be fair. However the Trump administration has carried out a series of actions that have inflamed Palestinian opinion and generally pleased Israel. In 2017 Mr Trump announced that the US recognised Jerusalem as Israel's capital, overturning decades of official US policy. In response Mr Abbas cut off relations with the US, saying Washington could no longer be a peace broker. Last year the US stopped contributing to the UN Relief and Works Agency (Unrwa), which has been supporting Palestinian refugees since 1949. In March President Trump officially recognised Israeli sovereignty over the occupied Golan Heights. On Saturday, speaking at a meeting of the Republican Jewish Coalition, he warned that a Democratic victory in 2020 could "leave Israel out there", in an effort to make the case to Jewish voters to support his re-election. Peace negotiations between Israel and the Palestinians have been at a standstill since 2014, when a US-brokered attempt to reach a deal collapsed.